Some of the best work “Game of Thrones” does is when it takes its time and lets its stories breathe. I know it is tough for a show with so many moving parts (well, at least it used to have many parts) to give the time every storyline and character deserves. But when it does, GoT rivals any show currently airing on television.  Take the opening of last season’s finale. The drawn out destruction of all of Cersei’s enemies was one of the show’s best scenes. But it wasn’t just the slow build of the moment, the growing intensity of the narrative, or the brilliant score in the background that made it work so effectively. It was also that each character was given the time for their role in the destruction of the great Sept. of Baelor to develop before the climatic moment. 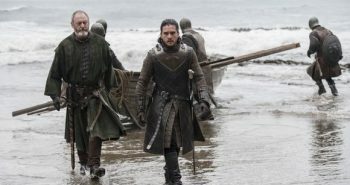 “Spoils of War” was such an episode for “Game of Thrones.” Sam, the Hound, the Brotherhood, Euron, the Unsullied, Jorah, the Wildlings, and the Night’s Watch (who’s been out of it for a while now) were all ignored so Stark reunions and battlefield slaughter could be given the time they needed. If any attention was given to those other stories, it would have taken valuable time away from the power of the episode’s great moments. Sansa and Arya needed to have their awkward reunion before Sansa could observe just what Arya has become. 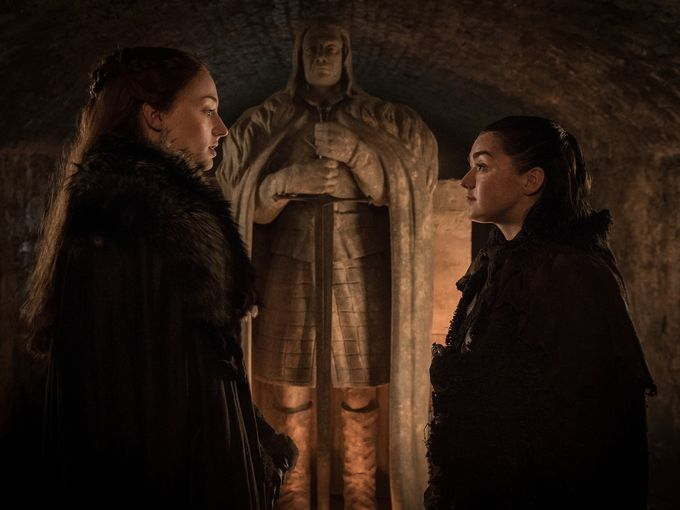 The moment where Sansa watches Arya fight Brienne one on one loses some of its effectiveness if it appears without having first had the reunion in front of their father’s grave. Jon and Dany moved a little closer to an alliance with the Mother of Dragons telling the King of the North she will help him. But she still insists he bend the knee. The thawing of relations between these two epic characters can’t be rushed. It has to be steady to be effective. And tonight’s episode was another step in that direction. And another in the show’s long line of epic battle scenes, character reactions rightfully received more attention than the battle itself. We get Jamie and Bronn’s horrified reaction to both stampeding Dothraki and Drogon’s roar. As men turn to ashes all around him, Bronn acts out of character as he desperately seeks the Dragon Crossbow in an attempt to save Westeros from further burning. And finally, there’s Tyrion, who’s prospective is one of a man on the winning side of a conflict who is horrified at what he’s seeing. And that focus on character made “Spoils of War” the best episode of season 7 so far. We only have three location in tonight’s recap. We’ll start in the North, where another Stark found her way back home. I was a little surprised Arya actually ended up in Winterfell. I guess I read a little too much into her encounter with Nymeria. Also, wouldn’t Arya be a more effective assassin if no one knew she was alive? Maybe showing off her skills wasn’t the best tactic for someone who wants to kill the queen? Oh well. At least Arya’s scenes were fantastically done. Sansa and Arya were not very close when they were last together, and it shows when Sansa embraces Arya but receives no embrace in return (second week in a row that’s happened to Sansa). But as they talk, Arya seems to realize how much Sansa has grown and returns the affection. Arya and Sansa meet for the first time since Season 1. Sansa, on the other hand, only sees her silly little sister at first. The “Lady of the North” laughs when Arya brings up her kill list. But then, Bran reveals that Arya does have a kill list, and she was heading to King’s Landing to take out Cersei, one of the names on it. And then, Arya more than hold’s her own in single combat with Brienne, a character Sansa knows is a beast in combat. Sansa now knows her sister has become a very dangerous person. 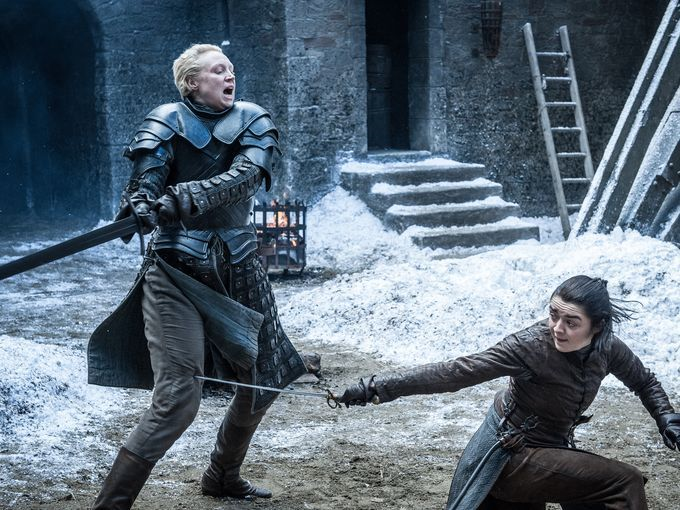 Brienne and Arya spar in Winterfell’s courtyard. Jon points out how the Children of the Forest and the First Men fought together to defeat the Whitewalkers, and Jon wants Dany to do the same. A more compassionate Mother of Dragons says she will help, but Jon must bend the knee. The debate is the same as last week, but both seem to be more understanding of the other’s position. But the good vibes of that meeting disappear once Dany receives the news that she’s lost the Tyrells and the Unsullied are trapped on Casterly Rock. The Mother of Dragons scalds Tyrion for his failed strategy so far as she plans to ride her three dragons into the Red Keep and take out Cersei herself. She ignores Tyrion’s rebuttal, but then turns and asks Jon what he thinks. The King of the North advises against burning down castles to claim Westeros because it would simply make her appear like everyone else who’s come before. So what does Dany have in mind to turn the tide in the war she’s losing? 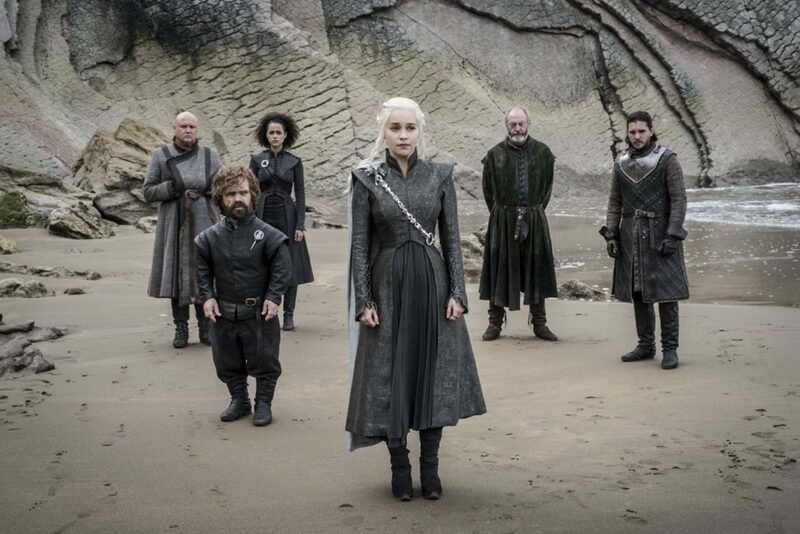 Daenarys and team Dragonstone looking out over the waters trying to decide what to do next. Lannister wagons are hitched up and leaving the recently conquered Highgarden with the former Tyrell fortune loaded up and heading to King’s Landing. Cersei told Tycho Nestorsis she would have the crowns debts paid back in full, and the stolen Tyrell coffers are the means in which to do that. 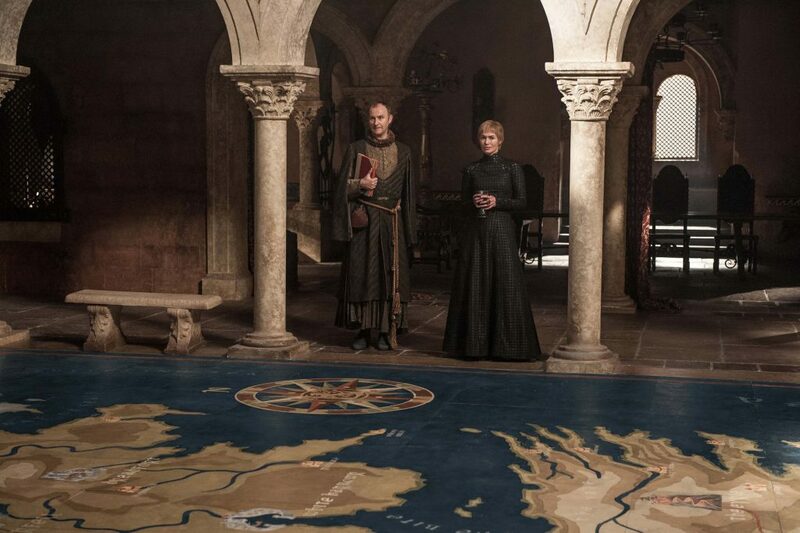 We receive word later that this money does indeed reach King’s Landing. The rest of our time before the big battle is spent as a reminder that Bronn is indeed just in it for the money. 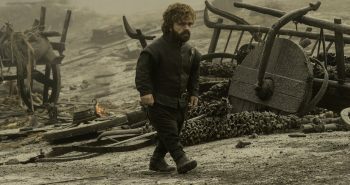 He collects a big bag of gold and talks about the castle he should get for all this fighting he continues to do for House Lannister. Otherwise, things seem peaceful for an army going back home after a big victory until Bronn hears something coming. First, it’s hoofs of running horses hitting the ground. Then, yelling and shouting leads both Jamie and Randall Tarly to prepare the troops to defend. Bronn wants to flee, head back to King’s Landing, and get behind the capital’s walls. But Jamie will not leave the fight. They seem to be building up the courage to take on the coming challenge when they are suddenly both terrified by Drogon’s roar. Up to this point, those in the south have mostly heard of all these mysterious things going on in the North and across the Narrow Sea. The rumors were out there that the last Targaryen had three full grown dragons and a Dothraki hoard by her side. 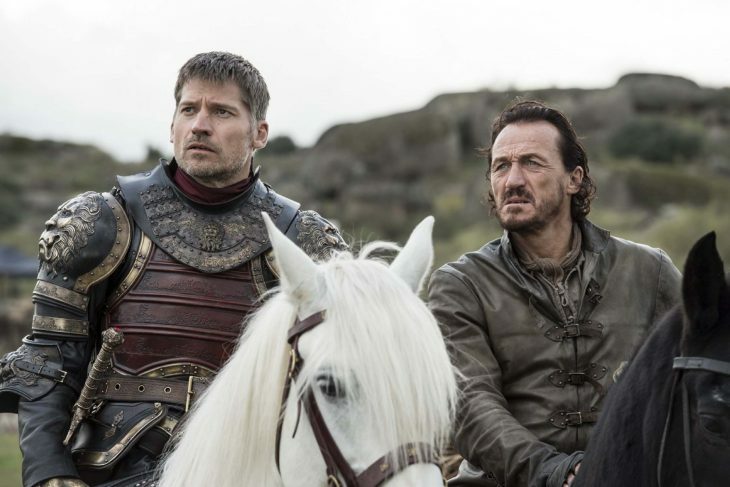 But the looks on Jamie and Bronn’s faces tell us they truly did not believe the stories until they saw that Dothraki hoard riding towards them with a dragon flying above it. Drogon and the Dothraki’s ride towards the Lannister lines. Daenarys is leading her troops into battle, and Drogon is dousing dragon fire on everything. The battle is a route. The tired Lannister and Tarly men had no shot against fresh Dothraki and a large dragon. Bronn loses the bag of money and leaves it knowing he has a more important purpose. Bronn desperately searches and finds the Dragon Crossbow Qyburn introduced two weeks ago. He loads up and fires a spear that takes down Drogon, but only hits him in the shoulder. Drogon regroups and Dany jumps off of him to try and remove the spear from his shoulder. Jamie sees the opportunity to end this war right here as he picks up one of the dragon spears and rides full speed towards Daenarys. Jamie riding through a burning field looking to take out the Mother of Dragons. But just a Daenarys notices him coming, Drogon turns his head and sends out more fire. Someone saves Jamie just before the fire can consume him. Jamie lands in water and, in full armor, is sinking to the bottom when the screen turns black. -Though we left his fate on a bit of a cliffhanger, I imagine Jamie will somehow survive the current plight he’s in. I just don’t see the show saving him from dragonfire only to have him drown in his armor. -We know Daenarys can control one dragon. But is she able to get all three to fly and work together in one battle? Or will two more riders be needed? I discussed this very topic in a piece I did previewing Season 5. -Missandei tells Jon that Daenarys is “the queen we choose.” It does not look like the people in Westeros are going to get that same choice. -Nothing of note about Jon and Theon’s meeting other than Theon is now back in Dragonstone as he waits for something important to do. -A couple of the cave drawings were the same pattern as the one’s the Whitewalkers made in the snow all the way back in Season 1. -I mentioned Cersei’s meeting with Tycho earlier. In that meeting, she mentioned the Golden Company, one of the most successful sell sword groups in all of Essos. We’ve heard the Golden Company mentioned before, but they have yet to appear on the show. Cersei discusses “investment opportunities” with Tycho. -The blade that was used in the attempt on Bran’s life back in season 1 was given to Bran, who then gave it to Arya. So Arya now has a Valayrian steel blade. -And I found it interesting the show would bring up who tried to kill Bran so long ago. In the TV show, the mystery was never solved. So could that answer play a key part in what’s to come? And wouldn’t creepy time vision boy know this answer already? Bran…I mean the Three Eyed Raven giving the Valayrian Steel Blade to Arya. 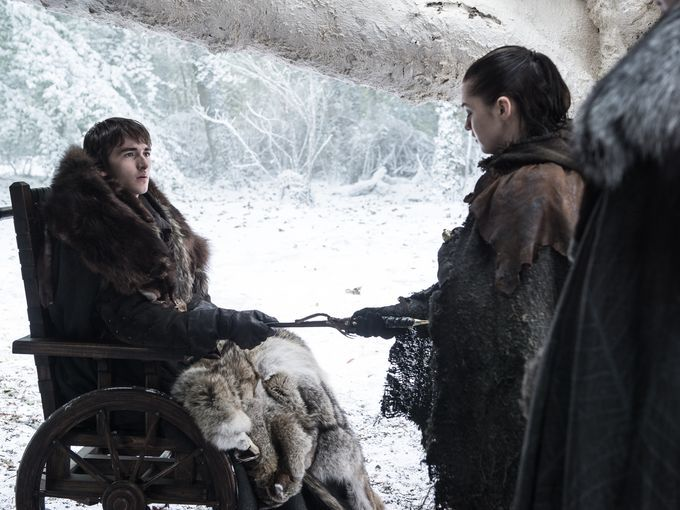 -Bran’s emotionless state has never been worse than in his stoic send off to Meera. The girl who dragged him all the way across the land beyond the Wall barely gets a thank you. -And if Meera is heading home, does that mean we will get to see her father, Howland Reed, at some point? Dany has struck her first big blow in the battle to take the Iron Throne. We’ll see who lands the next punch next week.